In the last article, I introduce the SN-28B Terminal crimping tool to make jumper wires or terminal connectors. But rather than leave it there, I’m going to show some electronic modules in my kit where I’ve added connectors. These electronic modules are generally self-contained circuits that perform a specific function. However, the modules by themselves might not provide any useful function unless connected to another module. For instance, a voltmeter module by itself cannot perform a useful function. 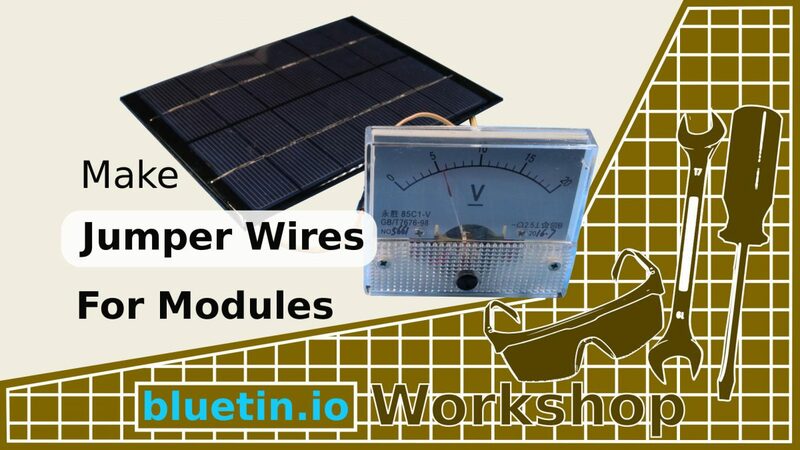 Yet connecting the voltmeter module to a small solar panel module, you create a useful function. Hence now you can compare light levels between each room in your house. So using the SN-28B terminal crimping tool to make connectors, we can join the different electronic modules together without needing to breadboard. Thus making a more compact circuit and saving a breadboard – on a long-term project especially. DC-DC Adjustable Step-up Boost Power Converter Module XL6009 with jumper wires attached. I have a sort of convention when choosing either male or female connection type. For instance, if the connector is supplying power or is an output type I use a female type connector. Using a convention like this will avoid accidental shorting of unconnected connectors. Of course, a short male to male or female to female jumper wires can be made to convert the connection type. Single pin jumper wires in a flat 40 wire ribbon cable. In case you do not have an SN-28B crimping tool you can still apply connectors to modules in similar ways. This is because readily made jumper wires are commonly available from websites such as Ebay and Amazon. Incidentally, though, these jumper wires will be supplied in single pin housings. However, the single pin housings might be replaceable with multiple pin terminal housings. Jumper wires, in the picture above, are typical of what you can buy. You can peel off a smaller ribbon as required. You can also cut to length to have bare wires at one end for soldering to modules. The electronic modules featured in this article are the type that can function without a micro-controller or Arduino compatible. This is just to avoid the article getting too long. Therefore other module types will be covered in later articles. Below you will find examples of modules to help drive some inspiration. The collection of modules I have were created over a long period of time as and when I needed them. However, the point of these examples is to demonstrate the usefulness of adding jumper wires to modules. 6-volt solar panel module measuring 136 x 110mm. Put a jumper connector on the back and it is ready to go for outdoor projects. Power banks are useful for portable projects that have a constant current draw. Use a USB adaptor to add a DC-DC converter for a wider voltage supply range. A super short USB lead connected to a micro USB breakout to jumper connector. Ideal for powering projects from a USB power bank. Another portable power option is a Li-ion 18650 battery with Lithium Battery Charging Protection Module – TP4056. Battery holders such as the 10 x AA holder shown above is an economical way to power projects using standard rechargeable batteries. As long as all the batteries have the same capacity, for a pack of batteries, charging can be made using a bench top power supply. Various DC-DC Voltage Converter modules. Mini-360 DC-DC Buck Converter Step Down Module 4.75V-23V to 1V-17V. Adjustable 4V-12V Step-Up Voltage Regulator U3V50ALV. XL6009 DC-DC Converter Constant Voltage Step Up Down with Automatic Buck-Boost. USB 5V DC Boost Step-up Power Supply Module DC-DC 0.9V-5V. I have a few different types of DC-DC voltage converters in my kit. Some are boost converters, some are buck converters and some that can buck-boost in one package. You would usually choose a DC-DC converter by selecting the one that fits the current rating and voltage range you require. I’ll be using various DC-DC converters in robot building projects coming up in future articles and videos. Jumper Wires Connecting DC-DC Step-Up Converter and Voltmeters. The meters in the above image are ideal for just plugging into your circuit. Therefore a good convenient way to monitor the voltage level for instance in your circuit. So these meters are modules you can plug into your module chain. The modules include voltmeters and ammeters. The meters are in the form of panel mount modules and are available in many different forms. You would have to solder jumper connectors to the tabs on the back of these meters to make them usable. An L.E.D. light module that was removed from a toy. A spare auto bulb with jumper wires soldered on. These can draw a few Watts so connect with care as DC-DC converters can get very hot. Useful to have jumper wires soldered to potentiometers to avoid analogue read errors. Read errors can occur when turning the knob while the potentiometer is directly plugged into the breadboard. DC motors are sometimes delivered without wires attached. Therefore a good opportunity to add your preferred connectors. Small or micro DC motors will work just fine with ribbon cable type jumper wires. Stall torque current of these motors is well within the 1 Amp limit of the AWG28 flat ribbon cable. SN-28B Terminal Pin Crimping Tool Guide – Link. The purchase price is going to vary greatly depending on how quickly you want the items. Therefore shop around checking out Amazon, Ebay and local electronic stores. Also, check the last article for searching related featured items – article link below. Rainbow Flat Ribbon Cable – Link. If you have not seen the last article, which is basically part 1 of this article, here is the link: SN-28B Terminal Pin Crimping Tool Guide – Link. Thank you for your support and interest in this article “Jumper Wires Made With SN-28B Crimping Tool Guide”.